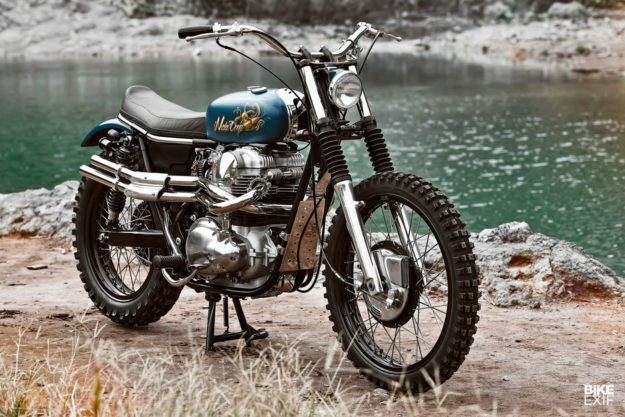 Think of a classic scrambler, and a Triumph desert sled probably comes to mind. 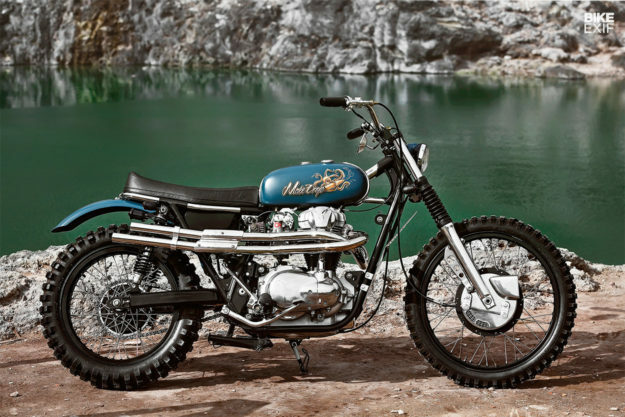 BSA and Matchless also made pretty good scramblers, and Honda had its CL series. But the other Japanese marques were noticeably absent. This stunning W650 hints at the missed opportunity. What if Kawasaki had got down and dirty with its W series in the 60s and 70s? Machines that, after all, were copies of a BSA. 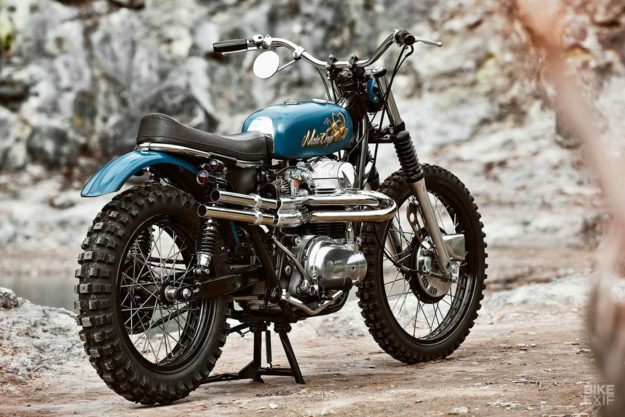 This thoroughly hoon-able W650 scrambler is the work of Mark Huang, who runs a moto parts business in Taipei, Taiwan. He does small custom jobs month-to-month and a couple of full builds every year. 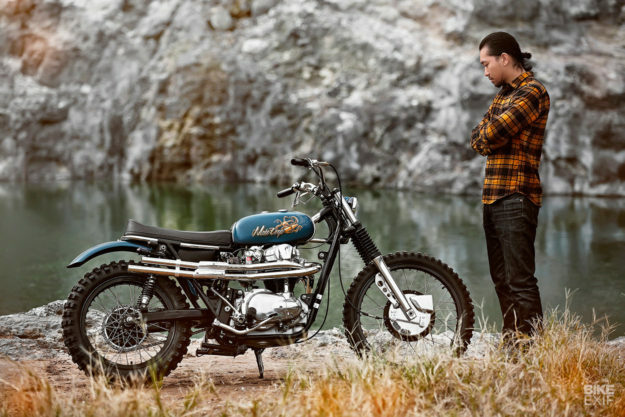 This scrambler is based on a 2004-model W650, and is packing a lot more custom work than you’d think. For starters, the frame has a new polished stainless steel backbone and subframe, joined to the original chassis via custom-made steel lugs. The effect is classy and neatly executed. The original chunky backbone was ground off just behind the steering head, but it’s been cleaned up beautifully. Mark’s also tweaked the stance for a scrambler vibe: It sits a little higher now, with a 21” front wheel in place of the original 19” unit, and a new set of Koni shocks out back. The rear wheel still measures 18”, but both wheels are actually new. The guys built them up using vintage Triumph T120 drum brake hubs, stainless steel spokes, and rims from the Mark Motorcycles store stock. That front brake is a stunner, but all the trick engineering is happening out back. 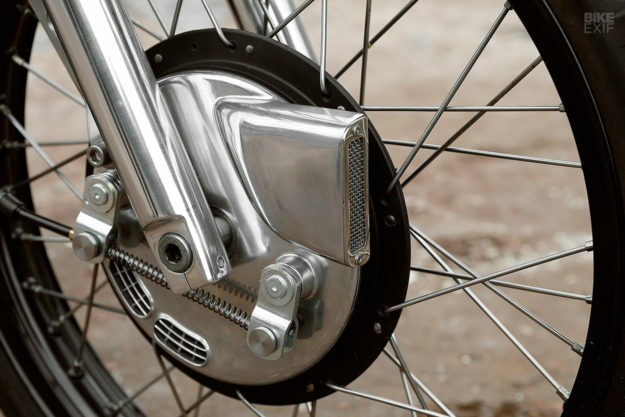 The T120 originally used a left foot brake—so the crew built a linkage to operate the left side brake with the W650’s right-side pedal. Up top, you’ll find a classic BSA fuel tank, complete with its traditional center-mount system (hence the new frame backbone that accommodates it). It’s also been adorned with stainless steel sections at the front and back, for a little extra flair. 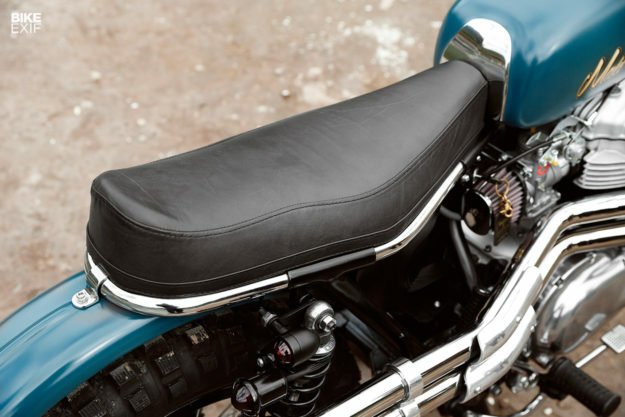 The seat’s custom too, and consists of a fiber-reinforced plastic base and leather upholstery. 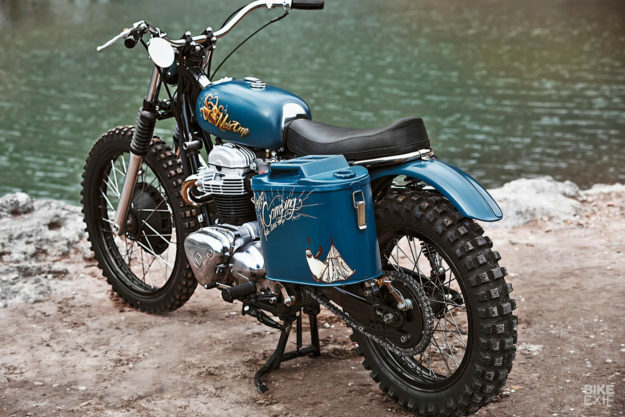 Together with the lengthy rear fender, it nails the retro desert sled vibe. Smaller upgrades and touches are littered throughout this W650. The carbs have been upgraded to Keihin CR35s, and the air box has been ditched for a pair of K&N filters. The exhaust is custom too; an elegant, high riding twin stainless steel system. Mark also rewired the W650, repacking everything into a discreet battery box under the seat. The ignition’s been relocated, and there’s no speedo, leaving the cockpit very sparse. 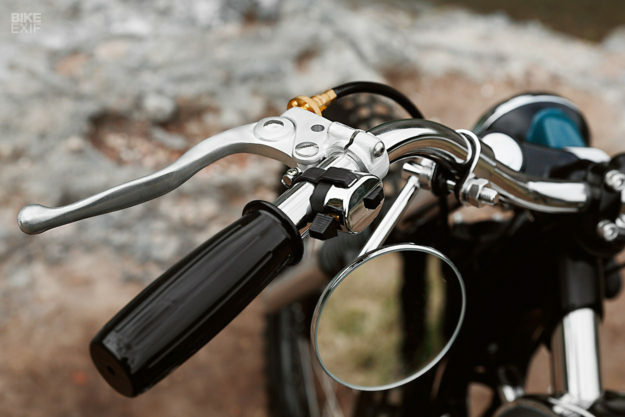 New parts include 1” bars, modded levers and basic switches—all from the Mark Motorcycles store. The headlight’s a small 4.5” unit, mounted on a custom bracket with a petite cowl finishing it off. A side mounted tail light and a full complement of turn signals round out the lighting package. 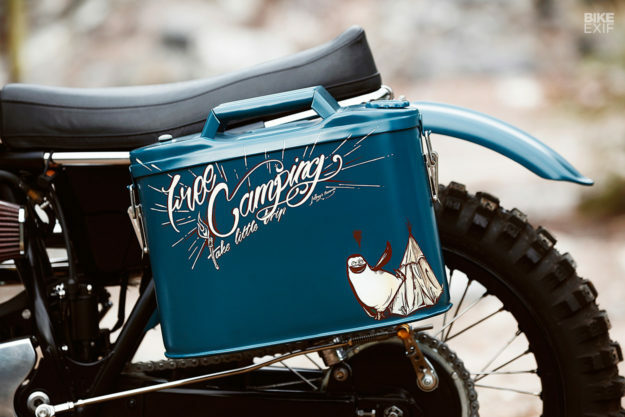 Other touches include a beefy engine protection plate, and our favorite bit: a military fuel can repurposed as a pannier. It’s a charming bike, made even more so by the top shelf paint job. 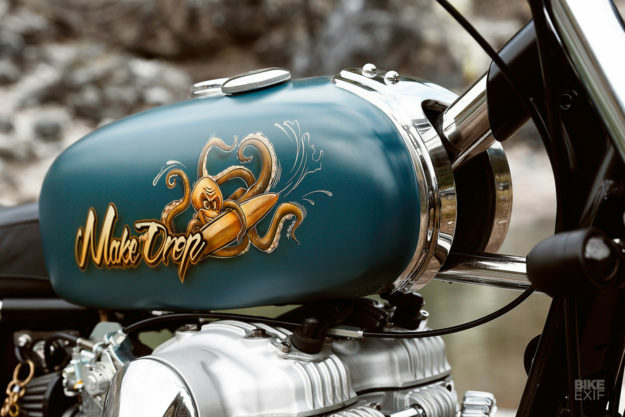 Mark always works with Jeffrey at Air Runner Custom Paint—the same guy that paints Winston Yeh’s bikes. The single tone blue seems basic, but just take a look at the shading on those graphics. And between the surfing octopus on the tank, and the penguin (from the movie Madagascar) on the pannier, there’s a healthy dose of playfulness here too. Mark tells us the bike’s owner is an outdoorsy guy—so we’re guessing he’s over the moon with his new ride. Wouldn’t you be?